Brown Moses Blog: Volcanoes In Damascus - Was Hezbollah Involved With Developing Chemical Munitions? The original Facebook post has been deleted, but the contents was reported here. 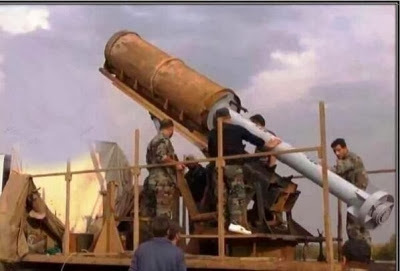 This is a screengrab taken from the video showing the Syrian National Defence Force launching UMLACAs, but what's interesting is commentators on Facebook claimed that this was a Hezbollah designed weapon, known as the "Volcano" described as "The Pride of Lebanese Industry". It could be said that the explosive version of the UMLACA is basically a larger version of the IRAM, and a suspected chemical variant of the IRAM shared at least one interesting feature with the chemical version of the UMLACA. It should be kept in mind these are just claims by commentators on a pro-Hezbollah Facebook page, so claims the weapon is Hezbollah made should be taken with a pinch of salt, and the NDF video showing the UMLACA claims it's a Syrian made weapon. This leaves many unanswered questions; it's not clear if both the IRAMs and UMLACAs are known as Volcanoes, or if it's an error by the commentators on the pro-Hezbollah Facebook page. If they are known as Volcanoes, does that suggest the UMLACA could be a more advanced version of the IRAM? Was Hezbollah involved with the use of IRAMs by the Syrian military, and did that in turn lead to involvement with the development of the chemical UMLACA? Does that mean Hezbollah has access to UMLACAs, potentially their first chemical weapon? At this stage it's too earlier to know, but it does add a new twist to the tale of IRAMs and UMLACAs in Syria. I'm thinking, if Syria has to ditch its chemical weapons, surely their preferred destinations would be Hezbollah and Iran? The 122mm improvised missile (occasionally called UMLACA) is also called volcano. The range on this occasion is about 2km, as the flash of impact and detonation is visible around 18-19s and the crash of detonation is on the sound track at 24s. The extent to which this proves anything about the chemical attack on the 21st of August is very, very moot. TNT is about 60% more dense than liquid Sarin, so I'd expect the HE version to be a great deal heavier even if the warhead volume was the same. Some of the HE warheads in videos look a bit longer than the images of crashed and empty chemical ones, too. Even if images of a CW launch become available, my method for estimating actual range achieved is unusable in the absence of a bright flash and a concurrent loud noise. But for this particular HE one, we're seeing/hearing 2km for a launcher on close to 45 degrees elevation. Which was one of the guesses for the heavy HE warhead. It's a good video in that respect. Weapons in this class clearly exist in the ME and the Syrian government is even supposed to have some, but their utility in a civil war bogged down in close range sieges must be nil. So as soon as we start to see video of rockets however blurry, ascending at high angles, we will know that not only has the weaponry changed: so as the tactical and strategic situation. As it is, the heavy HE rocket seems to be achieving what seems a pathetic range in terms of rounds available for a NATO MLRS, but which is all you need and want for urban siege warfare. The CW version needs to at least triple this range, something which cannot yet be ruled out if it's actually lighter than the weapon in this video. Your density and weight guesses are irrelevant because the HE and CW variants have different volumes and different motors - precisely because the HE is heavier. NB Sound takes 6 seconds to travel 2 km so your range guess in the video is way too long. The range would have to be around 3.8km for munitions fired from the northwest, as I believe that's about the closest the government had control of on the day of the attack, along the NW azimuth. I can't make out if there's a nose cone, the video quality is so blocky it's hard to know if something is just noise or an actual structure. I'm currently working with a specialists, he seems to think it's a much short range than even 2km. Everything is being double and triple checked, so bare with me, and I'll have more details soon. It's obviously under 2km. Probably well under - perhaps 1500m or less. So does this mean your 3.8km figure is wrong and that the Ghouta missiles were fired from insurgent territory - as whoghouta has previously determined? We'll soon find out, getting some professionals to check this video out to determine the exact range, then they can base the range of a chemical warhead and a warhead with a nose cone from that. They've never been seen with a nosecone nor has a nosecone ever been found in impact debris - so that is pure speculation and almost certainly wrong. I'm talking to other experts, so take a chill pill and relax. My expertise? 5 years in the Army including directing artillery fire, and I am a qualified meteorologist and physicist. Not hugely dissimilar to what I'm getting at the moment, everything is being triple-checked as well, to make extra certain. That would seem to put it well with in opposition territory, so next is establishing the situation on the ground in the locations it could have come from. Every single element has been covered with great detail by a large number of people and a consensus view established based on evidence. Who occupied the probably launch territory at the time has been minutely dissected. In simple terms it is most likely the insurgents were in possession of those areas at that time. Even if they weren't actually camped on the ground it would have been ridiculously dangerous for Government forces to drive some distance through hostile territory and set up a launching site. In comparison Government forces could easily have launched from safe sites at equally attractive targets. I prefer to have it established by recognised experts in relevant fields, for credibility's sake. whoghouta is evidence based. Each and every piece of evidence is available for dissection by any expert. Each and every conclusion is equally up for criticism. If there's something wrong it will be changed. It's a valuable resource and a unique collection of information on Ghouta and chemical missiles. I doubt there is any better collection available outside of national intelligence agencies. To ignore whoghouta is a folly. My preferred method of establishing credibility for the information I publish seems to have worked very well so far, so I'll stick to that for the time being. 18s to 24s is about 6s, so 2km by your own immensely patronising put-down, Charles. It's difficult to time exactly by a clock which moves in 1s jumps, so 2km and 1.7 km aren't really separable on the evidence available. I don't think the density is entirely irrelevant, and I'm not going to let you define everybody else's frames of reference, either. You mislead people a lot more cleverly than some of the Hasbara, but you are trying to lead everyone by the nose. I also think that if the cameraman pointed the camera directly at where he expected the round to land, it drifted left by a fair distance. Actually, it wouldn't surprise me if the miss distance was more than the arguable difference in range. This weapon is only worth the bother against densely populated area targets: even at these short ranges I don't think there's much chance of a direct hit on a specific strongpoint. Only the IRAM at bayonet charge range is going to do that. And there needs to be a spread of time as well as target area, because these are not rapid fire weapons. Against a modern well equipped army, these things are not going to be very useful at all, because they will do damage, but probably not to the right things before they are destroyed. Which rather argues against them being effective weapons for rebel groups who are fighting a proper army. I've been doing a lot of work on this, should have a big post on it later. Let's not get too distracted by the range issue: the article was about the implications in this perhaps being a Hezbollah weapon and all that would imply for Lebanon, regardless of the outcome and rights and wrongs of the Syrian Civil War. If it was a Hezbollah weapon, what would it be good for, for their purposes, in Lebanon and other places outside Syria? Not for taking on Israeli forces or bombarding anything further into Israel than border posts, even if its range was higher than Charles believes. Especially given the fairly lengthy setup and load procedure, if it gets within range of a worthwhile Israeli target it's going to be vapour before its ready. Not for attacking US forces on British bases on Cyprus, either. But for re-starting the Lebanese civil war and carrying out murderous bombardments within Beirut and other Lebanese cities: I'm afraid it would be ideal. 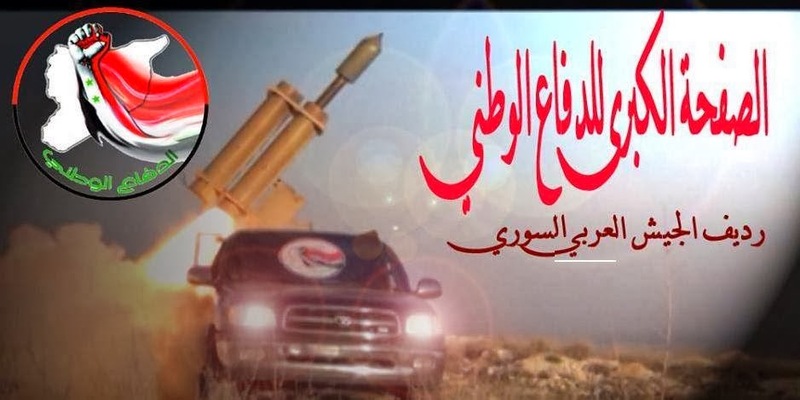 So, if it is a Hezbollah weapon, I think their purpose in building or acquiring it would be to drive non-Hezbollah groups out of Beirut and sectarian/ethnic cleansing, particularly against the smaller factions with no heavy weapons. Trying out tactics for this kind of thing must be at least part of the reason why Hezbollah is in Syria in the first place. Is somebody trying to sell a made-up story? The chemical weapons stuff is over and done. Nobody really cares. If Hezbollah had Sarin they would care. The Israelis track Hezbollah manufacturing and rocket tests, so how could they possibly miss such a threatening enterprise? Without wishing to get into the issue of whether some people are here primarily to lead us up the garden path, Charles might enjoy a visit to Anglesey Abbey sometime. Other sites frequented by large numbers of "experts" of like mind will very likely produce more consensus than insight. I find this more interesting, especially when people post links of factory-made Russian thermobaric weapons in the ruins of apartments in Damascus. My first comment on your range estimate was wrong as I was distracted at the time by a cat and so I underestimated the time gap. My subsequent comments were based on varying degrees of technical analysis of the video including use of video and audio editors to time events to millisecond resolution if not precision. On review there is a slight error in my explosion sound time and it should be 23.9 seconds giving an audio time of 6 seconds precisely and a distance of 2022m. The idea of throwing a big lump of explosives across the street is a natural consequence of an opponent refusing to take a subtle hint. The factory made single tube 107mm was used in Lebanon, in across the village fighting, there was also an over under version like a shotgun. The 107mm wasn't effective against concrete, and co-existed with larger warhead improvised drainpipe weapons. They seem to have gotten married. "Was Hezbollah Involved With Developing Chemical Munitions"
That's a bit of a conspiracy leap. Beside was Hezbollah not also a complaining victim of the gas attack according to US intel sources?